Alnwick ladies cool off after the race at Strathclyde. 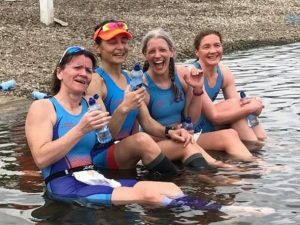 Glasgow’s Strathclyde Country Park was the host venue for the British Sprint Triathlon Championships over the bank holiday weekend, attracting top triathletes from all over the UK including some of Alnwick’s finest multi sport competitors. First up were the veteran men with Phill Hall and Steve Carragher battling through a large field in the 750m loch swim. Steve settled into a comfortable pace to exit in 5th position whilst Phil swam a PB to come out of the water in 38th. Phil’s bike strength showed as he blasted through the field on the undulating 20km bike leg, clocking the second fastest time to start the run in 16th whilst Steve dropped to 10th. With temperatures over 24degrees, fast run times were unlikely however Steve worked hard to make up a few places to finish in seventh place and Phil ran a good 5km to complete the British championships in 18th position. The Female veterans were next into the loch including a strong quartet of Denise Drummond, Victoria Curry, Tracey Sample and Lisa Williams from Alnwick. ‘Coach D’ demonstrated her fantastic swim background by exiting the water in 2nd position. ‘Coach T’ was not far behind in 6th and then Victoria and Lisa closely followed into T1 in 10th and 12th. Denise held her position throughout the 4 lap bike leg, entering transition 2 in second position. Meanwhile Lisa moved up to 9th, Victoria to 10th and Tracey dropped to 12th. This made for exciting viewing for the final run leg as Denise held on for the bronze medal in her age group, a fantastic achievement which will no doubt inspire her students at the Duchess high school when she returns after half term. Another battle was continuing behind as Lisa stormed through the run to finish in 9th. Victoria had a great run to hold on to 10th and Tracey was happy to be competing at the highest level again following hip surgery, finishing in 12th. Next up for Alnwick were Stephen Cowell and Ian Atherton in the over 50’s men’s race. Both men had strong swims and consolidated their positions on the bike with Stephen entering T2 in 42nd and Ian 12th in their age groups. Ian and Stephen ran great final legs to finish in 14th and 34th respectively in their age groups. Audrey Stewart and Lynne Bannister were competing in the over 50’s female race and both acquitted themselves well in tough fields. Audrey swam, biked and ran consistently to finish a strong 12th in her age group and Lynne competed well to come 10th in hers. Four Alnwick Tri Juniors travelled up to Scotland for the British Championships to be held on exactly the same course as the adults. Millie Breese, competing in the Tristar 2 race (aged 11 to 12) made a great start, swimming in contention with the leaders and then rode a great bike leg to enable her to capitalise on her strong running style. She Breezed home in a fantastic 6th position in a very strong field. In Tristar 3 (13 to 14 years) Max Breese and James Carragher were joined at the hip throughout the swim and bike legs and came into T2 alongside each other having biked themselves into the top 10. Max ran well to finish in 12th position and James dropped to 16th. Maddy Hall was Alnwick’s sole representative in Tristar 3 girls and performed well. Her bike leg was one of the fastest and she ran strongly to finish in 13th.